From additional Telephone, Computer or TV points to complete house pre-wiring, we can assist you. By using our specialised services, you can be confident the correct product has been installed for your needs by a licensed cabler. Only quality Cat5e UTP, Cat6a UTP and Cat7 STP cable and connectivity products are used for all network cabling. All Australian standards and regulations are adhered to or exceeded for all works completed. 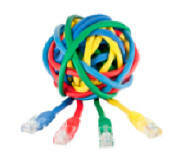 We can unravel all your cable needs. © 2012 - Intergrated Communications, Pty Ltd. All rights reserved.